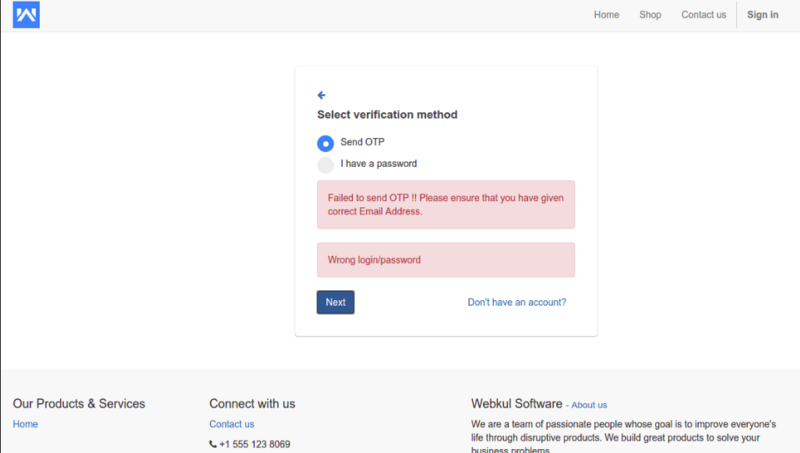 Odoo Website OTP Authentication module brings one-time password facility to the Odoo website. Now the Odoo website customers have the choice to sign in using a password or an OTP which is sent to their registered email address. Odoo Website OTP Authentication app provides a two-layered security to the customers’ accounts to secure the accounts. If the Odoo admin enables OTP authentication from the Odoo backend, the customers can create an account after verifying the email address through OTP. The module brings the functionality of One-Time Password for the Odoo website customers. It adds the functionality to register via OTP while creating the account on the Odoo website. The customer’s email address is validated with the OTP during signing up on the Odoo website. Moreover, the customer can choose to log in to his Odoo website account with an OTP instead of the password. The OTP is sent to the customer’s registered email address. The OTP validation information along with their success status will be maintained in the backend. Check existing user during sign-up. The Odoo Admin can set expiry time and OTP type (password or text) for the OTP. Moreover, it also allows the Odoo Admin to configure the email template of the sent OTP. The module is cross-browser compatible. Once you purchase the App from Webkul store, you will receive the link to download the zip file of the module. Extract the file on your system after the download finishes. You will be able to see a folder named- ‘otp_auth’. Copy and paste this folder inside your Odoo Add-ons path. Now, open the Odoo App and click on the Settings menu. Here, click on Activate the Developer Mode. Then, open on Apps menu and click on ‘Update Modules List’. In the search bar, remove all the filters and search ‘otp_auth’. You will be able to see the module in the search result. Click on ‘Install’ to install it. 1.) In the Odoo backend, Navigate through Website >>> Webkul Website Add-ons. 2.) Here, click on the ‘configuration’ tab next to OTP Authentication. 3.) On the popup that appears you can manage the permissions for Odoo Website OTP authentication module. 4.) Tick the checkboxes next to Sign-up Authentication to enable OTP when registering on Odoo website. Similarity, Tick the check next to Sign In Authentication to enable OTP for the customers while logging in to the Odoo website. 5.) Next, set up the OTP time limit. This defines the expiry period for the OTP sent on the customer’s registered email address. 6.) Also, set the OTP type as Password or Text. Click Apply. 7.) Now, go to the Odoo website as a visitor. Click on Sign In tab. 8.) Then click on the ‘Don’t have an account’ tab to signup for the website. 9.) Fill in your details as a visiting customer i.e. Name, email address, number, and password. 10.) Now, tick on send OTP to the email address entered in the form. 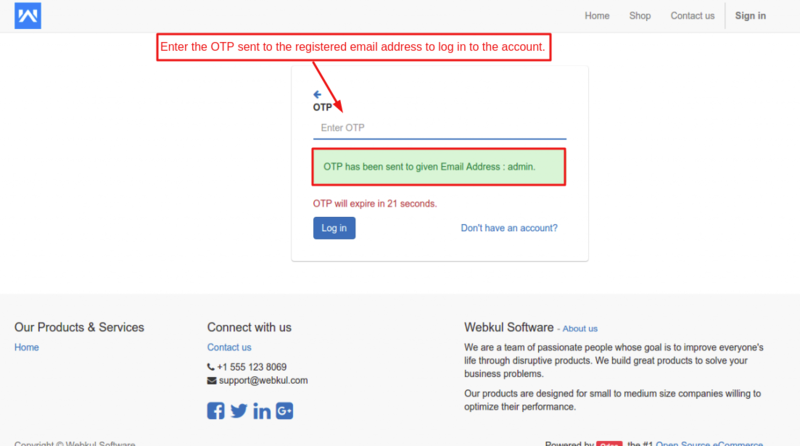 On clicking the tab- ‘Send OTP’, a popup appears stating that the OTP is sent to the email address. 11.) You can also see the time countdown indicating the period for which the OTP is valid. 12.) Enter the OTP to successfully create an account. An account can be created without entering the OTP if the OTP authentication is enabled in the Odoo backend. 13.) Now, to sign in, enter the registered email address. Now, the customer has two options- use the password or OTP. 14.) Click on OTP to receive the one time password on the respective email address. 15.) Enter the OTP to log in to the account. 16.) If the customer enters an email address which is not registered with the Odoo database, message prompt appears asking to enter correct email address. Was this article helpful? Please share your feedback in the comments below.